Sternwheeler, hull was built at Gallipolis, Ohio, then construction was completed at Cincinnati, 1864. 160 x 31 x 5. Machinery came from Pittsburgh, 16's- 4 1/2 ft. Two boilers. Built for Capt. F. Ford whose financial partner was Frank Cathbern, of Parkersburg, West Virginia. Va. Was at Pittsburgh in March 1864, loading for Cincinnati. Went to St. Louis, and sold from there to Capt. H L. Lee in New Orleans, November 1867. Sold a month later to Capt. Charles C. Pickett, (whose name is on this waybill, in the upper left corner) New Orleans, who ran her in the New Orleans-Opelousas-Atchafalaya trade. Sold to Mobile, Alabama in December 1870. Burned and lost at Wetumpka, Alabama with a load of cotton on January 13, 1871. Engines, 16's - 5 ft. were from the FLORENCE LEE. Built for the Evansville & Tennessee River Packet Co., John Gilbert, president. 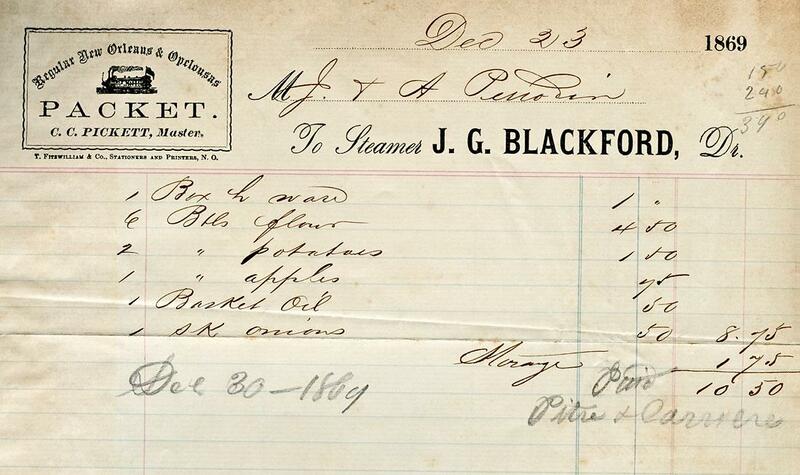 This waybill was filled out in on December 5th, 1886. 10 months later the SILVER CLOUD was destroyed by fire at Birmingham, Kentucky on the Tennessee River, October 12th or 13th, 1887. 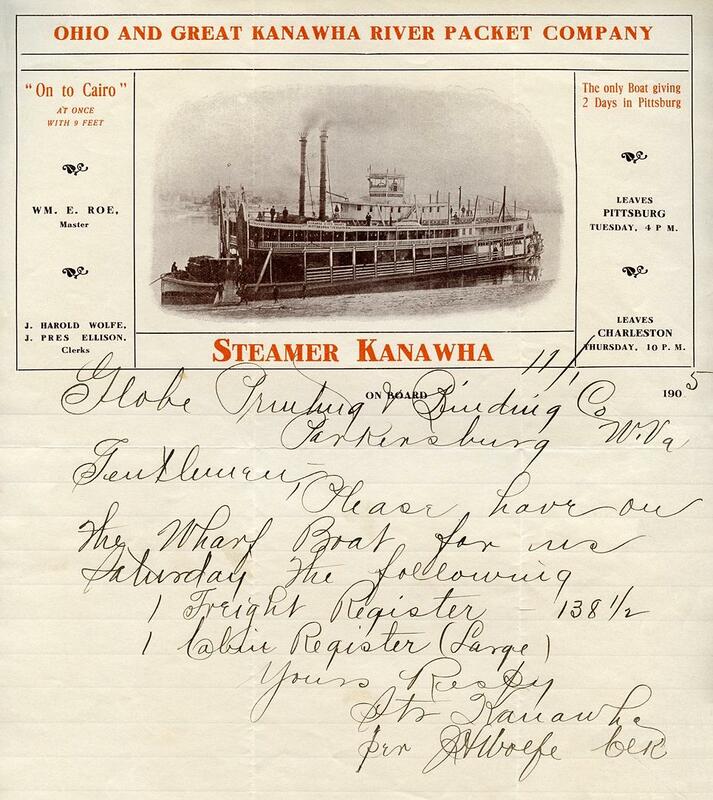 Hand written letter to Globe Printing and Binding in Parkersburg, West Virginia on the steamboat KANAWHA's letterhead by the clerk J. Harold Wolfe (whose name is the 2nd to the last of 3 gentlemen whose names are printed on the letterhead). 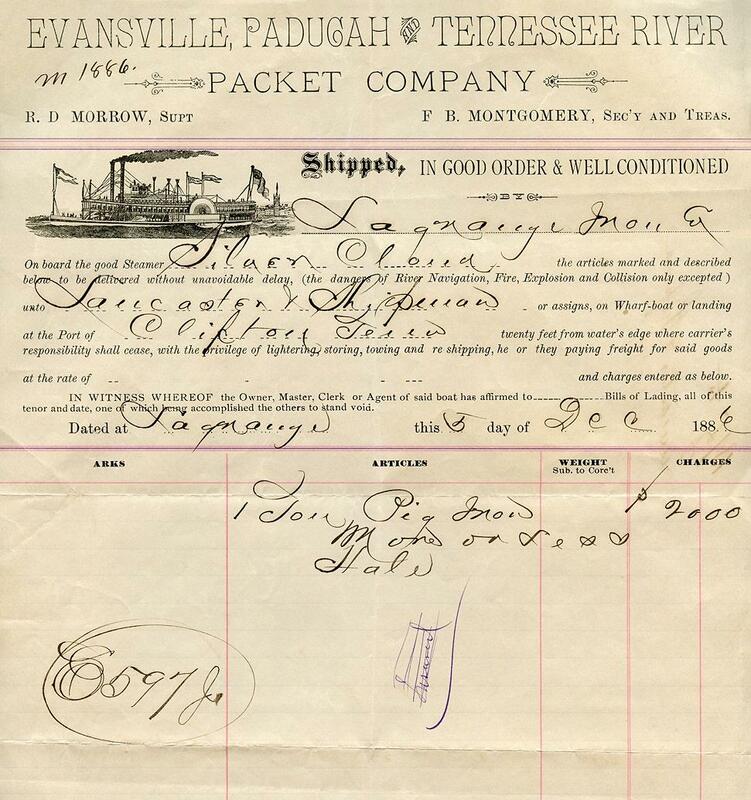 The letter dated November 1st, 1905 requests "registers" (blank log books) to be delivered to the company's Wharf Boat, presumably at Parkersburg. Built at Ironton, Ohio in 1896. Came out new with high pressure engines, 15's- 6 ft., and these were replaced in 1909 with compound non-condensing Marietta engines, 10's- 17 /2 's- 6 ft. Three boilers. She was built by the Bay Line, Ironton, Ohio, for the Pittsburgh-Charleston trade. Came out new with Capt. Ira B. Huntington, master, and the pilots were Henry Ollom and Henry Brookhart. In March 1899, Capt. T. T. Johnston became master. On November 10th, 1899 Capt. William E. Roe (whose name as "Master" is the first one printed on this letterhead) of Williamstown, West Virginia, bought the boat and ran her between Pittsburgh-Charleston until October 1912. Most famed exploit came in mid-summer 1911, when the Rivers and Harbors Committee from Washington, D.C. rode the KANAWHA from Pittsburgh to Cairo during bone-dry weather and the river so low that all regular packets were laid up. She hit bottom every day but one and from Tell City to Owensboro a pilot in a rowboat sounded ahead to find the deepest water. Captain Roe sold her to John W. Hubbard on October 20th, 1912, but bought her back on December 7th, 1914, still in the Pittsburgh-Charleston trade. On the evening of January 5th, 1916 she landed at Little Hocking, Ohio and in backing out hit a steel pier on the outer lockwall of Dam 19, overturned, and ten lives were lost. The details of this tragedy appear in the Sons & Daughters of Pioneer Rivermen Quarterly THE REFLECTOR in the June 1966 issue. 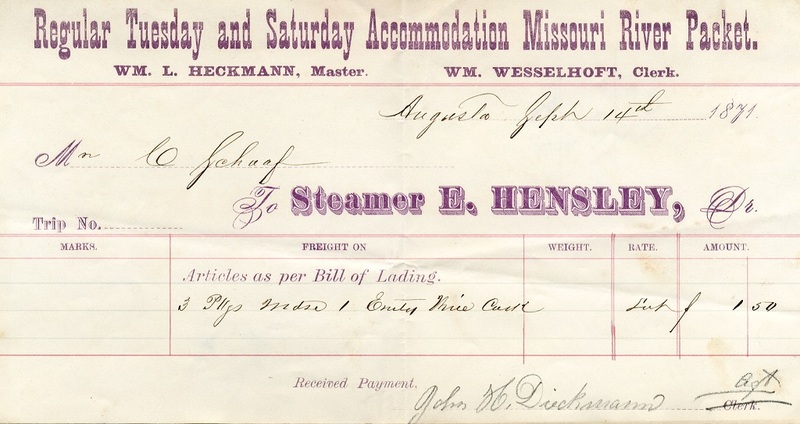 The printed portion of this waybill for the EXCEL corresponds with Fred Way's biography in which the clerk's name: S.A. Devinney is mentioned and the date March 20, 1901 (the first year the boat was in operation) at "Pom" (short for Pomeroy, Ohio) was one of the 8 ports of call listed along the top of the waybill. 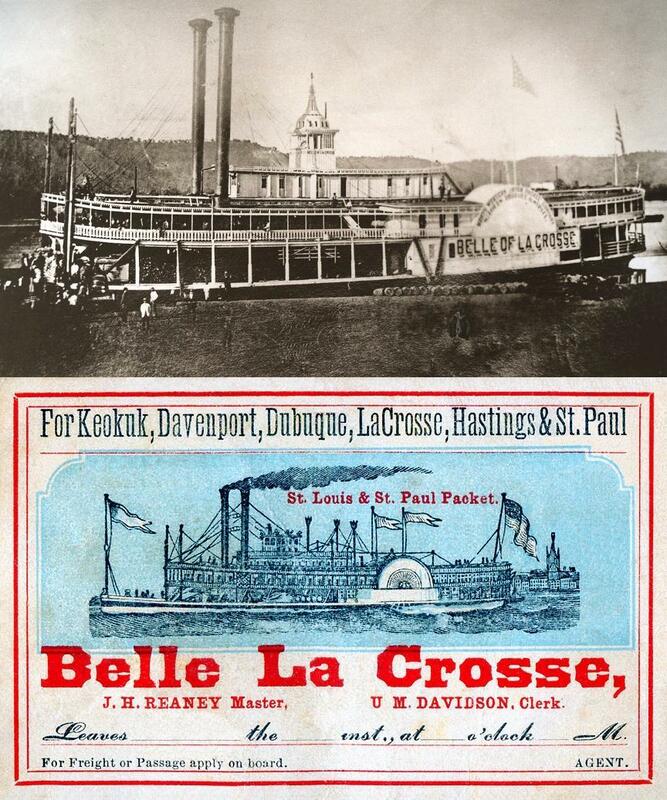 Under the heading "For Freight On" is written "MARY LOUISE" a steamboat that isn't listed in either of Way's Directories and is not listed in the La Crosse steamboat collection either. Cargo from the MARY LOUISE may have been transferred to the EXCEL or vice versa; OR the EXCEL may have towed the MARY LOUISE when her engines weren't working. The Murphy library has a photo of a boat named EXCEL (Negative 11892) which in appearance is plainly a "pool style" towboat, in appearance like the W.P. SNYDER, JR. not a packet, so the photo is probably of the towboat EXCEL (1881-1897) built at Brownsville, Pennsylvania which is listed as Number T0773 in WAY's STEAM TOWBOAT DIRECTORY. Came out new in the Millwood-Middleport trade. 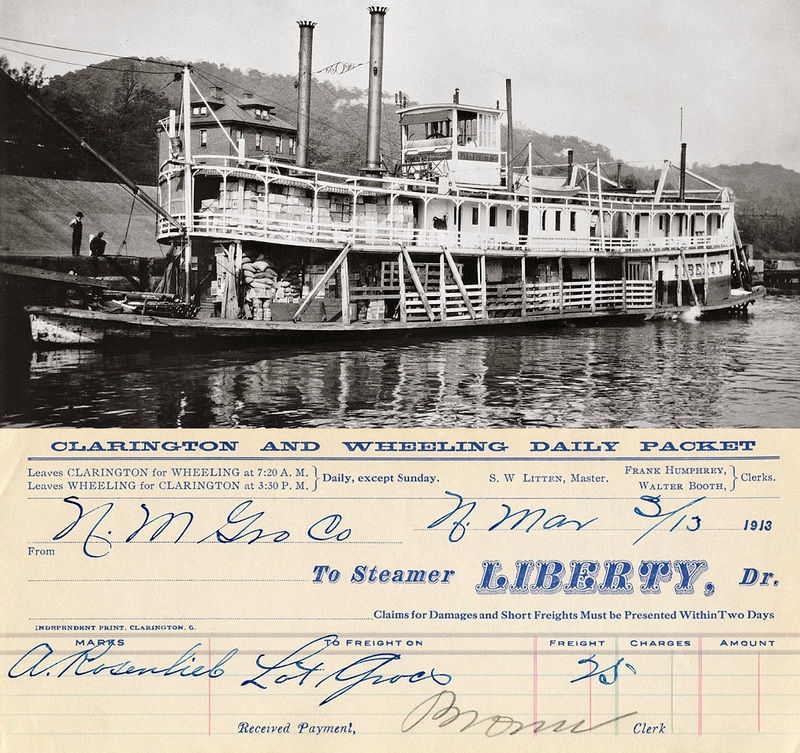 Photo Courtesy of Murphy Library at the University of Wisconsin - La Crosse Steamboat Collection Photographs. One of my favorite waybills with the neat vignettes of steamboat and the horse shoe with a fan floating inside it. Filled out on February 25th, 1884. Built 1882 Harmar, Ohio at Knox Yard 120 x 22 x 3 Engines, 10's - 3 1/2 ft. from the steamer SCIENCE. Built as a low water packet by George Strecker and Rodick Bros., Marietta. Spent most of her first five years running various trades on the Muskingum River out of Zanesville, Captains Ed Martin, Lou Myrick, and James McCoy Running Parkersburg-Middleport in 1887 with Capt. George B. McClintock, master, and J.M. Deem, clerk. Shortly thereafter sold to J .O Dueber of the Dueber Watch Works who used her as a pleasure boat in the Cincinnati area and once made a trip with guests to the Upper Ohio. Dueber sold her to Biddle Bros., Parkersburg, W Va. Ran briefly in the East Liverpool-Steubenville trade, Captain Logan Noll with Wm. Wilkin, clerk. 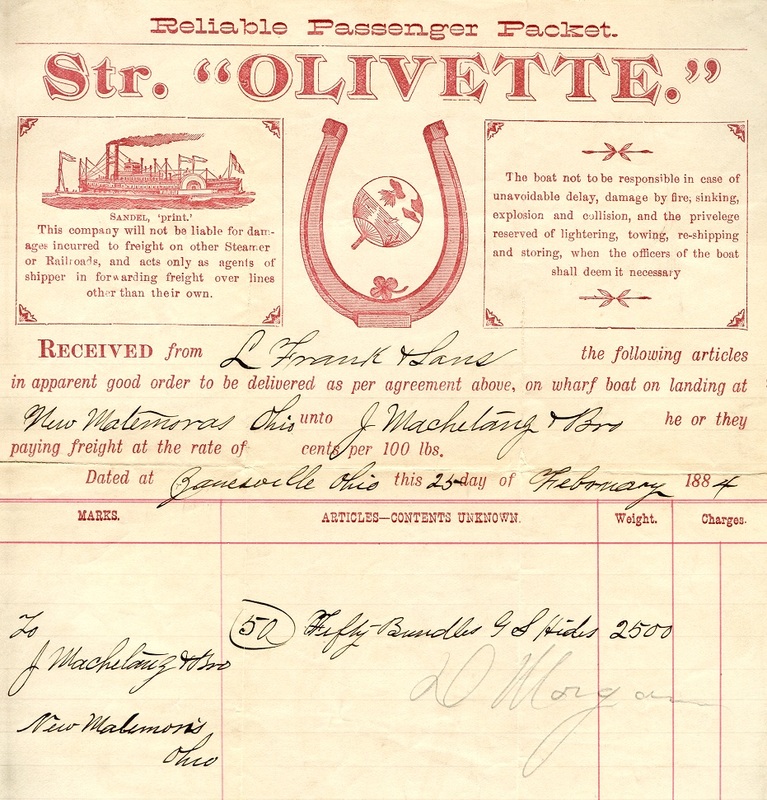 In 1894-1895 ran in Pittsburgh-Elizabeth, Pennsylvania, trade, Captain Joseph C Ketchell with H.M Lowe, clerk. Converted into a towboat fall of 1896, at which time C.W. Posey bought her entire. Her last owner was Samuel W. Carpenter, a marine diver with headquarters at the Allegheny River, Pittsburgh. She caught fire at his landing January 24, 1904, spreading the flames to the packet ELIZABETH moored alongside, resulting in the loss of both. Three boilers, 41" by 26 feet, 5 flues. Wheels 28 feet in diameter with 20 foot buckets. Engines came from the ITASCA, was later given the engines from the KEY CITY said to have been identical in size to the ITASCA's but improved her speed. Belonged to the Keokuk Northern Line. Burned at St. Louis on July 12, 1882, at 4:00 P M., foot of Alma Street, setting fire to the NORTH WESTERN which also burned. 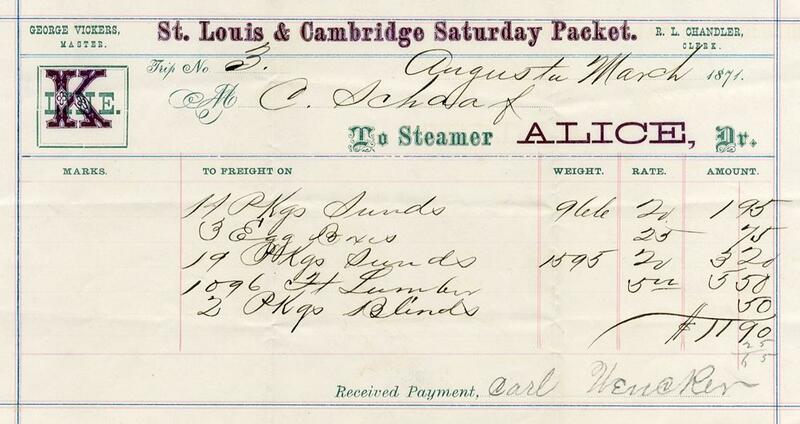 Receipt for 2 cotton bales shipped aboard the J.M. WHITE involving two transactions, the first one near the end of December 1878 and the second in late January 1879. I THINK THE TWO DATES COVER THE TIME OF THE TRIP DOWN THE THE RIVER AND WHATEVER TIME IT LAY ON THE LEVEE AT NEW ORLEANS. THE TIME OF YEAR WOULD BE A PERIOD WHEN THE BOATS HAD A LOT OF COTTON TO LOAD SO IT WOULD TAKE LONGER TO MAKE THE TRIP DOWN THE RIVER AND INCLUDED TIME OFF DURING THE CHRISTMAS AND NEW YEAR'S HOLIDAYS. Cotton quality is graded as "Good Ordinary"
On the East Carroll Parish Louisiana blogspot there is a listing for a Planter named "R.C. Rhoton" The abbreviation TN suggests that Mr. Rhoton was from Tennessee originally. If this was the same R.C. Rhoton, the first initial "R" could have been written down as an "A" by mistake. Rhoton, R. C. m 33 Planter TN 3,000. In 1882 a towhead, so-called, had been formed on the sandbar created by the accretions to the Louisiana shore, which was named 'Newman's Towhead' because the owner of the Louisiana mainland at the point from which the bar had made out was a man named Newman. On This towhead there had sprung up a growth of willow and cottonwood timber. Her engines were from the T.N. Barnsdall, Royal, Liberty. She was built for the Wheeling-Clarington trade. By 1918, she was running to New Matamoras, then to Parkersburg, and entered the Wheeling-McConnelsville trade in September, 1918. On December 20, 1918 she went into Pittsburgh for the first time, extending her route to Pittsburgh-McConnelsville. In August, 1920 she started running Pittsburgh-Zanesville and a texas was added to her at that time also. In the fall of 1921, she left that trade and ran Gallipolis-Charleston, then Pittsburgh-Wheeling where she was quite successful. In 1929 she took over the Pittsburgh-Charleston trade which had been abandoned by the Senator Cordill. In April, 1932, the Liberty made two trips above Charleston to Boomer, West Virginia with freight. In June, 1936 she quit the Pittsburgh-Charleston trade. She was the last regular packet to operate year-round out of Pittsburgh. In the summer and fall of 1936, she towed the showboat Goldenrod with the Major Bowes' Amateurs show. To advertise the show, she once left the showboat at Star City and went to Morgantown, West Virginia and back playing calliope music the whole time. The Liberty was caught in the 1936 flood on the lower Ohio and was stripped of her whistle, bell, fittings, etc. by vandals. Walter Webster bought her, fixed her up, and returned her to the Parkersburg Docks in February 1937, having been caught in the 1937 flood enroute. She was attached for debt and sold for $195 on July 27, 1938. Captain Raike dismantled her at Kanauga, Ohio. Her engines went to the towboat Valley Belle. Her whistle was found and put on the towboat Mildred. 4 x 9.30 inch blotter from OHIO RIVER TRANSPORTATION CO. Pittsburgh, PA Fall Schedule Rates Effective Nov 1st, 1931, for the LIBERTY and the SENATOR CORDILL. We have Waybills from both of these boats in this collection. Whoever was using the blotter rubber stamped the date Aug 15th, 1933 twice in the left margin. 213 Tons, 141 feet long. "Off the lists in 1876." Captain Joseph Kinney owned the ALICE on the Missouri River in the early 1870s, he named it for his younger daughter. Sunk by a snag near Frankfort, Missouri on Sept. 12, 1874, raised. A sidewheeler named ALICE established the first government lights on the Ohio and many on the Mississippi. The Ohio River lights were first placed by ALICE in 1875, and after that the work was done by LILY. The ALICE serviced lights on the Missouri to Kansas City in 1876, and was working the Mississippi as well. She departed St. Louis Feb. 25,1878, Captain William Crapster, servicing lights to New Orleans. In the spring of 1878 the ALICE broke 70 or 80 timbers on a snag up the Missouri River and was returned to St. Louis for docking. Built at Cincinnati, Ohio 1862. 100 tons. Ran Gallipolis-Charleston, and during the Civil War was active in U.S. transport service. Sold in March 1865 to Captain W.L. Maddy, Gallipolis, who with R.W. Goodwin, clerk, continued her in the trade. She was running low water in the Portsmouth-Big Sandy trade when she hit an obstruction below Sciotoville and sank on July 23, 1867. The TELEGRAPH took her passengers to Portsmouth. VICTOR No. 3 was "Off the lists in 1869"
Hull by L.M. and W.F. Speer; engines by James Rees; boilers by James Thorn. Entered Pittsburgh-St. Louis trade; replaced the FINANCIER that was lost the year before. In January 1868 delivered at Marietta, Ohio six hogsheads of New Orleans sugar consigned to McConnell and Edwards, McConnelsville, Ohio, the first in seven years since the Civil War started. 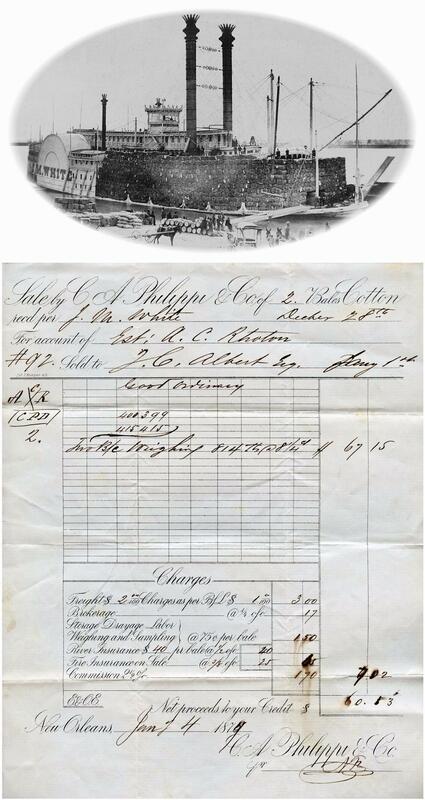 This waybill filled out at Evansville, Indiana in September of that first year, 1868 of operation for the BELLE VERNON. First boat through the enlarged Louisville and Portland Canal when it was opened in late fall 1870. Brought New Orleans sugar and molasses to Pittsburgh February 1871 and that April loaded at Pittsburgh for St. Paul and return to St. Louis. Sunk in ice at Cincinnati in February 1872 and was raised and rebuilt. She was downbound Cincinnati to Memphis under the command of Captain Kenniston in 1873 when she struck the wreck of the JENNIE HOWELL near Shawneetown, Illinois and was lost with four deaths. The clerk, Billy Shaw, had also been second clerk on the JENNIE HOWELL when she sank. Machinery was salvaged and returned to Cincinnati aboard the James D. Parker. everything on this page is from a private collection.